It’s time again for our semi-annual review of new board books. Along with the usual board books adapted from picture books (which we will review next month), here are some fun, new, original board books. Evanson, Ashley. San Francisco: a Book of Numbers. Grosset & Dunlap, 2015. [14p.]. $6.99. ISBN 978-0-448-48914-8. Part of the “Hello, World” series which also includes titles focusing on Paris, New York, and London, this counting book uses examples from San Francisco. There is one cable car, two dragons to represent Chinatown, eight “sea lions at Pier 39,” and so forth. The graphic color illustrations are engaging, but sometimes the items sound vague. “Seven fancy houses” represent the Victorian painted ladies, and the “Nine ball players” are not wearing Giants’ uniforms. But overall, a nice addition with local color. Light, Steve. Cars Go. Chronicle Books, 2016. [16p.]. $9.99. ISBN 978-1-4521-5067-3. Similar to Light’s earlier transportation board books Trains Go, Boats Go, Diggers Go, and Planes Go, this board book is a dozen inches wide but only six inches tall. This gives each spread a span of two feet, showing the car on the road, including a truck, jalopy, police car, taxi, and hot rod. The deeply saturated paint on while backgrounds make for dramatic illustrations, and the text has repetition and onomatopoeia that will grab a storytime crowd. Barash, Chris. One Fine Shabbat. Illus. by Tatjana Mai-Wyss. Kar-Ben, 2016. [10p.]. $5.99. ISBN 978-1-4677-5871-0. A rhyming text describes an autumn Sabbath day for twins Sophie and Seth, in this simple introduction to Shabbat. The family picnics and sees some new baby calves, on a Saturday that will be familiar to many preschoolers who have similar “day of rest” experiences. Marshall, Linda Eloritz. Shh…Shh…Shabbat. Illus. by Evgenia Goubeva. Kar-Ben, 2016. [10p.]. $5.99. ISBN 978-1-4677-5873-4. Each day of the week is described in a short rhyme, full of alliteration, ending with Shabbat. Oddly, the only day of the week not mentioned by name is Saturday; it may have been helpful for children to understand Shabbat is on Saturday for Judaism. The colorful animal-and people-filled cartoon illustrations add more detail. Newman, Tracy. 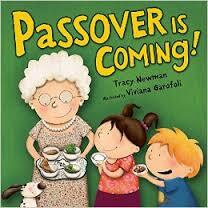 Passover Is Coming! Illus. by Viviana Garofoli. Kar-Ben, 2016. [10p.]. $5.99. ISBN 978-1-4677-5242-8. A two line rhyme on each page is followed by the phrase “Passover is coming!” in this simple introduction to the holiday. Preschools can use this is for a storytime on Spring holiday traditions, with the audience calling out the repeated phrase. Some of the items mentioned, such as the afikomen, will need an adult to explain, but this book is a nice way to begin the conversation. Anon. “Let’s Play” Spanish/English. Scholastic, 2016. [10p.]. $6.95. Let’s Go to the Park! Vamos al Parque! ISBN 978-0-545-00410-7. Let’s Have fun! Vamos a Disfrutar! ISBN 978-0-545-00416-9. Let’s Eat! Vamos a Comer! ISBN 0-978-545-00412-1. Let’s Play! Vamos a Salir! ISBN 0-978-545-00414-5. Color photos of ethnically diverse babies and a parent are shown doing common activities, like playing on the swings. The bilingual text is very brief, with declarative sentences such as “I smell a flower.” Not particularly clever or memorable, these are great for parent-child sharing because they offer universal experiences. Holm, Jennifer L. and Matthew Holm. “My First Comics” series. Random House, 2016. [20p.] $7.99 each. The Holm siblings, best known for the easy to read “Babymouse” graphic novels, have created a board book graphic novel series. Using a combination of full page illustrations with some paneled artwork pages, this combines traditional comic book art with a board book size. In I’m Grumpy, a cloud and the sun exchange dialogue about their moods. In I’m Sunny, the sun and a tornado share a red balloon. The simple text includes a few sentences, dialogue balloons, and some onomatopoeia that will hold the attention of a toddler. But these books will also work for emergent readers, who will be able to read these because the full color cartoon-style illustrations help those who are guessing at the text. A winning new series that is sure to be popular with a wide age range. McPhail, David. I Get Dressed. Roaring Brook, 2015. [12p.]. $5.99 . ISBN 978-1-62672-147-0. McPhail, David. I Play. Roaring Brook, 2015. [12p.]. $5.99 . ISBN 978-1-62672-148-7. Technically, there is no series name for these charming books. The illustrations originally appeared in David McPhail’s My Mother Goose (2013). Here, they have been repurposed to help young children learn some simple vocabulary. For example, a bear is shown in several poses to demonstrate “walk,” “run,” “jump,” and other movements in I Play. The bear is the only character in the book. In I Get Dressed, several different animals are wearing clothing, captioned with one word, such as “dress” or “socks.” Likely to be a favorite with toddlers is the pig in brightly colored underwear! A perfect fit for babies. Miura, Taro. Bum Bum. Candlewick, 2016. [22p.]. $8.99. ISBN 978-0-7636-8784-7. Miura, Taro. There, There. Candlewick, 2016. [22p.]. $8.99. ISBN 978-0-7636-8785-4. Originally published in Japan in 2008, and adapted and expanded in these new English language versions, these two charming board books do not have a series title. Both celebrate animals; in There, There the animal’s sound is featured, in Bum, Bum it is the animal’s backside (sure to promote uproarious laughter). Each has a simple, repetitive text, but it is the eye-grabbing graphic full color illustrations that are the standout feature. They resemble cut paper and almost have a three-dimensional feel. These could even work with a baby storytime. Nosy Crow. “Sing Along With Me!” series. Illus. by Yu-hsuan Huang. Nosy Crow, 2016. [10p.] $8.99 each. Old MacDonald Had a Farm. ISBN 978-0-7636-8652-9. The Wheels on the Bus. ISBN 978-0-7636-8648-2. The lyrics to popular preschool songs serve as the text of these engaging board books. Sliding doors embedded into the pages give the book a strong tactile element, and add more illustrative material. For example, in Wheels on the Bus, readers can move the wipers on the bus, or push a tab to turn the wheels. Both books feature full-color illustrations of animals in human clothing, depicting the words in the lyrics. Hopefully, the parent or caregiver reading the book to a child can expand by demonstrating the hand movements and adding more lyrics. The publisher includes a QR code for those who want to download the song. Patricelli, Leslie. Potty/Bacinica. Candlewick, 2010/2016. [26p.]. $6.99. ISBN 978-0-7636-8777-9. Patricelli, Leslie. Yummy Yucky Ñam! Puaj! Candlewick, 2003/2016. [26p.]. $6.99. ISBN 978-0-7636-8776-2. Patricelli’s delightful baby is back in these two bilingual versions of previously published books. In Potty, baby really needs to go, so he gives the potty a try, which requires patience. In Yummy Yucky, baby contrasts two things; for example, “Spaghetti is yummy. Worms are yucky.” A useful library purchase. Davies, Benji. Bizzy Bear, Deep Sea Diver. Nosy Crow, 2015. [8p.]. $6.99. ISBN 978-0-7636-8647-5. Bizzy Bear goes under the sea in his small yellow submarine, where he sees various animals. The rhyming text invites participation due to repeated phrases, but doesn’t identify the various sea creatures by name. Like the previous books in the series (I believe this is the 18th), each spread has a sturdy wheel to turn or tabs to slide. Not essential but a nice, tactile book that is appropriate for toddlers. Steers, Billy. Tractor Mac: Friends on the Farm. Square Fish, 2015. [16p.]. $8.99. ISBN 978-0-374-30168-2. There are several previous “Tractor Mac” books, but this is the first with tabs and flaps to open. Using sturdy board pages and small flaps to reveal parts of the story, Tractor Mac helps Carla the chicken find her ten lost baby chicks. Each spread features one of the other vehicle characters, such as Plane Jane and Tucker Pickup, so this will please fans of books with machines. The text is a little long for a board book, using a paragraph per page when one sentence may be more appropriate for the younger age group. But many older toddlers and preschoolers will appreciate the story and tactile elements. Deneux, Xavier. “Touch Think Learn” series. Chronicle Books, 2016. [16p.]. $14.99 each. These French imports do not have a story, but the tactile elements will engage many babies and toddlers. Each spread features a large raised object that fits into the opposite page like a puzzle piece. For example, in Homes, the castle fits into the area showing the king, along with several words that describe items in the illustration. The graphic illustrations on white background and the small text make these for one-on-one sharing only, so this series has somewhat limited appeal. « ACL’s Reviewers Guide, Cleary’s 100th Birthday, and More!